I’m Max, and I do gameplay programming and design. I joined Frictional about a year and a half ago, and I’ve been working on one of our super secret projects since. For the first nine months or so I, like everyone else, worked from home. Last summer we got an office set up in the heart of Malmö. Since then the amount of days I spend working from home has reduced greatly, though I still do it from time to time. Setup at home and at work. 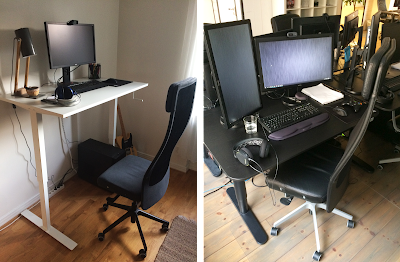 These are my two workspaces, the first one in the office and the other one at home (which is rather bare bones right now, moved in just a couple of days ago!). They’re quite similar; both the computers and the chairs are the same kind. I wanted to be even more consistent and get the same type of desk as the office one at home, a decision that was ultimately overruled by my better half (apparently it doesn’t go with the rest of the decor). Games have always been a big part of my life. Most of my time growing up was spent either playing games or talking about games. But, for quite a while, my family didn’t have a PC. Which meant I was stuck playing all sorts of old, weird games on rapidly aging Apple computers. 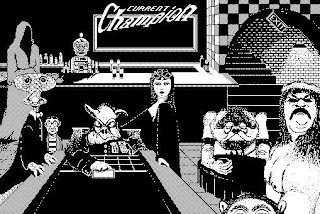 One of my earliest gaming memories consist of repeatedly failing at air-hockey, losing to a hideous pig-man in Shufflepuck Cafe on my dad’s old Macintosh. Eventually I scraped together enough money to put together my first PC, in front of which I would stay rooted for the following years. In addition to playing, I spent a lot of time creating custom content for games with my friends. It was always quite basic though, as I hadn’t learned any programming yet. For a year or so I studied film and media studies at the university, with a diffuse goal of wanting to work in games down the line. 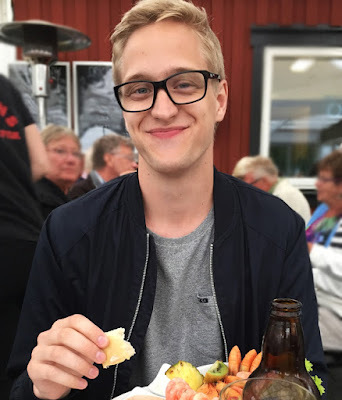 One night my girlfriend gave me a push, and I applied for a three-year game development program at Blekinge Institute of Technology (BTH). My years at BTH were a mixed bag. On one hand, we had a lot of freedom and got to work on tons of small projects, which was very fun and super rewarding. On the other hand, some courses felt like they were only marginally related to game development. Working on side-projects during your spare time was crucial. I got through it all by finding a good group of like-minded students that I stuck to for the entirety of the education. Our final project was a side-scrolling adventure game called Far Away - you can watch the trailer for it on Youtube. Perfectly in sync with graduating, I stumbled across a job opening at Frictional and sent in an application. Over the following weeks I answered some additional questions, did a work test and finally had an interview. A couple of days before I would hear from Frictional, I got a job offer from another company in software development. I clumsily explained to them I was waiting on another offer and asked for a few more days. Finally, I got an email from Fredrik and Thomas offering me the job. It was a no-brainer, and I happily accepted. My first few weeks at the company consisted of completing a list of introductory tasks, to learn more about the tools and the engine. This was a lot of fun, and culminated in the creation of a silly mini-game where I got to put everything I had learned to the test. After I had completed the introductory tasks I got to work on Safe Mode for SOMA, which was something I was really excited about -- contributing to a game I truly thought was great. From the get-go, we felt it was important to maintain the monsters’ threatening presence in order for their new behaviours to gel with the overall tone of the game. We couldn't just disable their ability to harm you; doing this would end up breaking immersion (imagine repeatedly throwing a toolbox in Akers' face and him just standing there, taking it). Instead, we tried to focus on how to best tweak each monster's behaviour in a manner that suited that particular encounter. For instance, some might eerily walk up to you and size you up, and can even bluff charge you if you’ve strayed too close. To further enforce the behaviours fitting with the world, we decided that if you were to actively mess with monsters (like invading their personal space for too long, hurling trash at them and so on), they should still be able to hurt you, just not kill you. Overall it was a very worthwhile experience, and I'm quite happy with how it all turned out. Now I’m working on one of our secret projects. As the gameplay programmer/designer workflow has already been described in previous posts I won’t go into detail, but my days in general are spent designing and scripting events and scenes, as well as programming gameplay systems. Additionally, I thought I’d talk a bit about the differences in working from home compared to working in the office. We’re also gonna do a proper office tour later on, so stay tuned! This is our office! Currently, we’re around seven people occupying this space, probably with more to come. It’s quite seldom all of us are here at once though, but there are usually a few people around. And on the off chance that you’re here by yourself one day, fear not; there’s always the noisy, seemingly stiletto heel-wearing, tap-dancing travel agency crew upstairs to keep you company (seriously). So, it really isn’t all that crowded here. But, seeing as most of us don’t work from the office, we often have meetings over Slack. It can easily get annoying for your desk-mates if you keep babbling on and on in various meetings throughout the day, which is why we’ve set up a separate meeting room. It also moonlights as a test room, complete with a TV, some dev kits and a monster webcam. The fact that the company is split into people working from home and people working in the office could potentially lead to complications, such as communication issues. In order to prevent this we’ve made sure that all important decisions and discussions still happen over Slack, to keep everyone in the loop. So far this policy has worked well, and the transition has been quite smooth. In the end, a typical day of work in the office is very similar to one at home. There is of course the added social aspect of working in the same physical space as you colleagues, which is great, but if you one morning feel like you’d rather stay at home and work, you can. Having this option every day really is quite luxurious. Other than this, and the requirement to wear pants, the routines of working in the office and and working from home differ very little. On the last day of the cold January Will from Extra Credits sat down to stream SOMA, and for the first few hours of the game he was joined by his friend and Frictional employee Ian Thomas. Ian worked on scripting, coding, and level design for SOMA, and is now the Story Lead on one of Frictional’s two upcoming projects. During the stream he answered some questions from the viewers, ranging from what type of pizza he thinks Simon had in his fridge, to ways of minimising dissonance between the player and the character in a narrative game. In this blog we’ve compiled the best questions and answers into an easily readable form. So go get a beverage of your choice and dive into the everyday life at Frictional, narrative game design and tips on networking in the industry! Or, if you’re not the reading type, you can also watch the whole video on Twitch. Have some other questions? Hit us up on Twitter and we will try to answer the best we can! Q: Does the Frictional team scare each other at the office? We didn’t have an office until recently, and even now most people are still remote, so not really! The thing about being behind the scenes in horror is that it’s very difficult to scare yourself, and each other, because you know what’s going on. We do play each others’ levels every other week, and it’s always brilliant to get a decent scare out of a coworker. Otherwise we don’t hide in the office cupboards or anything like that… regularly. Q: Is it true that developers don’t actually play their games? No - we play our games thousands of times, and most developers do! It does depend on where you sit in the development chain. If you work for a very big company and only do something like facial models, you might rarely play the game until it’s close to completion. But in a team the size of Frictional everyone plays the game all the time. That’s how we get our primary feedback and develop our levels before the game goes anywhere near alpha testers. Q: How about after they’re released? Probably not that often. For me personally there are two reasons, which both have to do with time. Firstly, I’m probably already working on a new thing. Secondly, during the short downtime after a release I’m trying to catch up on games I had to put aside during development. But it depends: for example, when I worked on LEGO games I would later play them with friends, because they’re so much fun to sit down and co-op play. 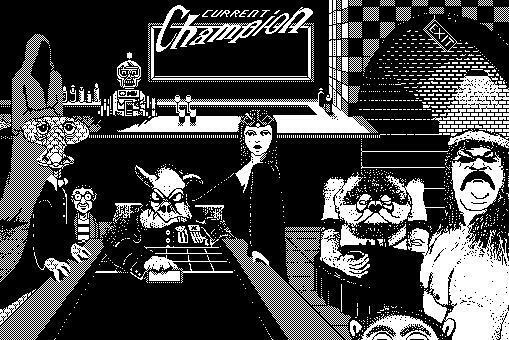 For a couple of years after the release you might be fed up with your game and not want to see it, but then you might come back to it fresh. With SOMA I sometimes tune into livestreams, especially if I’m feeling down. That’s one of the kicks you get out of this stuff – knowing which parts of the game people are going to react to, and getting to watch those reactions! That’s the best payoff. Q: Did the existential dread of SOMA ever get to the team? Q: Why did SOMA get a Safe Mode? SOMA was originally released with monsters that could kill you, and that put off some people that were attracted to the themes, the sci-fi and the philosophy, because they saw the game as too scary or too difficult. Thomas and Jens had discussed a possible safe mode early on, but weren’t sure it would work. However, after the game came out, someone in the community released the Wuss Mod that removed the monsters, and that and the general interest in the themes of the game made us rethink. So now we’ve released the official Safe Mode, where the monsters still attack you, but only if you provoke them – and even then they won’t kill you. You can now avoid one of these three death screens! The concept of death in games is a strange one. All it really means is that you go back to a checkpoint, or reload, and all the tension that’s built up goes away. The fact is that game death is pretty dull. It becomes much more interesting when it’s a part of a mechanic or of the story. We at Frictional have talked about it internally for a while, but it’s something we’ve never really gotten a satisfactory answer to. So, all in all, even if you turn on Safe Mode, it’s not that much different from playing the game normally. Q: What type of pizza does Simon have in his fridge? 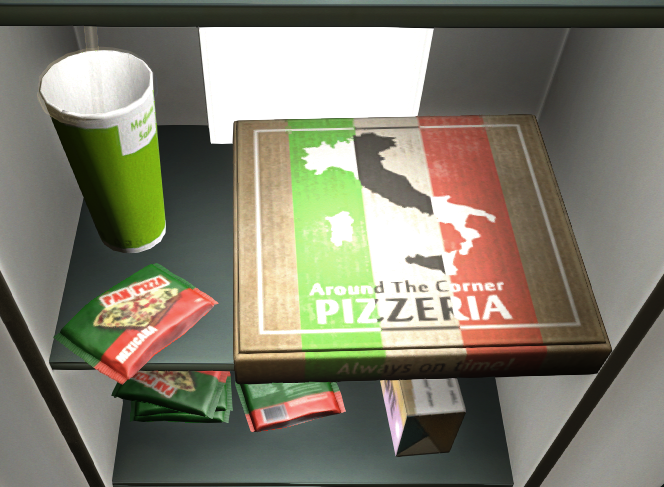 Schrödinger's pizza! And a Mexicana. Unless they mixed it up at the factory. In which case it's also a Schrödinger's pizza. Q: What was the funniest or hardest bug to fix in SOMA? There were so many! You can find some of the stuff in the supersecret.rar file that comes with the installation. I spent a lot of time fixing David Munshi. His animation really didn’t behave and he kept leaping around the place. He was so problematic, especially in this sequence where he was supposed to sit down in a chair and type away at the keyboard. We had so much trouble with that - what if the player had moved the chair? We couldn’t lock it in place, because we want the player to be able to mess with these things. We went around trying to come up with an answer for ages. And then someone on the team went: “Standing desk!”. Problem solved! It’s silly little things like this which tie up your time. For all you thirsty Munshi lovers out there. You know who you are. Another similar element was the Omnitool. It was a fairly major design thing that we came up with to connect the game characters, and to gate scenarios. We were struggling trying to tie these things together, and then it was just one of those days when someone came up with one single idea that solved so many problems. It was a massive design triumph – even if we realised later that the name was a bit Mass Effect! Q: Why does using items and elements in Frictional’s games mimic real movements? This is one of Thomas’s core design principles: making actions like opening doors and turning cranks feel like physical actions. It binds you more closely into the game and the character, on an unconscious level. 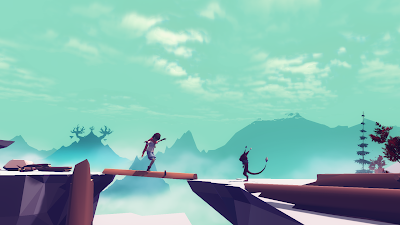 We’ve spent an awful lot of time thinking about ways to collapse the player and the character into one and make the player feel like a part of the world. It’s a subtle way of feedback that you don’t really think about, but it makes you feel like you’re “there”. There’s an interesting difference between horror games and horror films in this sense. You would think that horror movies are scarier because you’re dragged into the action that moves on rails and there’s nothing you can do about it. But for me that kind of horror is actually less scary than the kind in games, where you have to be the person to push the stick forward. We try to implement this feedback loop in other elements of the game too, like the sound design. When a character is scared it makes their heartbeat go up, which makes the player scared, which makes their heartbeat go up in turn, and so on. Q: Why didn’t SOMA reuse enemies? It obviously would have been much cheaper to reuse the monsters. 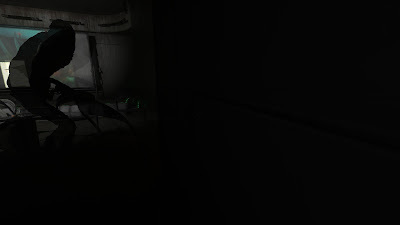 But in SOMA it was a clear design point, since each of the enemies in SOMA was trying to advance the plot, get across a particular point in the story, or raise a philosophical question. Thus, the enemies were appropriate to a particular space or a piece of plot and it didn’t make sense to reuse them. 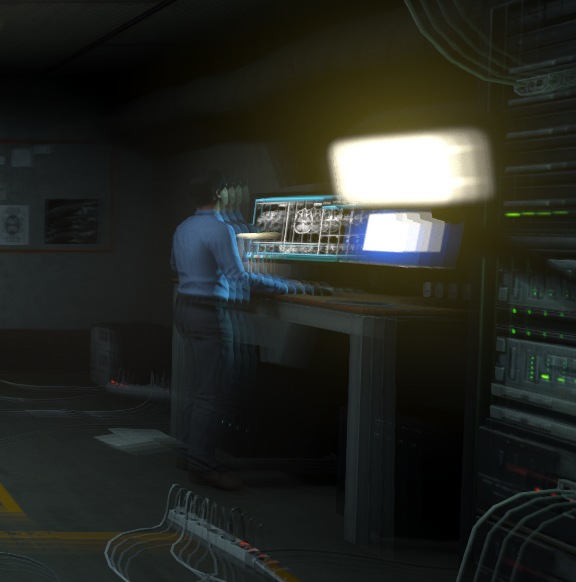 Q: Did SOMA start with a finished story, or did it change during development? The story changed massively over the years. I came on to the game a couple of years into development, and at that time there were lots of fixed points and a general path, but still a lot changed around that. As the game developed, things got cut, they got reorganized, locations changed purpose, and some things just didn’t work out. Building a narrative game is an ever-changing process. With something like a platformer you can build one level, test the mechanics, then build a hundred more similar levels iterating on and expanding those core mechanics. Whereas in a game like this you might build one level in isolation, but that means you don’t know what the character is feeling based on what they’ve previously experienced. You don’t really know if the story is going to work until you put several chapters together. That’s why it’s also very difficult to test until most of it is in place. Then it might suddenly not work, so you have to change, drop and add things. There’s quite a lot of reworking in narrative games, just to make sure you get the feel right and that the story makes sense. You’ve probably heard the term “kill your darlings” – and that’s exactly what we had to do. A lot of the things were taken out before they were anywhere near complete – they were works in progress that were never polished. Thus these elements are not really “cut content”, just rough concepts. Q: The term “cut content” comes from film, and building a game is closer to architecture or sculpting. Would there be a better name for it? A pile of leftover bricks in the corner! Q: How do you construct narrative horror? Thomas is constantly writing about how the player isn’t playing the actual game, but a mental model they have constructed in their head. A lot of our work goes into trying to create that model in their head and not to break it. A central idea in our storytelling is that there’s more going on than the player is seeing. As a writer you need to leave gaps and leave out pieces, and let the player make their own mind up about what connects it all together. From a horror point of view there’s danger in over-specifying. Firstly having too many details makes the story too difficult to maintain. And secondly it makes the game lose a lot of its mystery. The more you show things like your monsters, the less scary they become. A classic example of this is the difference between Alien and Aliens. In Alien you just see flashes of the creatures and it freaks you out. In Aliens you see more of them, and it becomes less about fear and more about shooting. It’s best to sketch things out and leave it up to the player’s imagination to fill in the blanks – because the player’s imagination is the best graphics card we have! There are a lot of references that the superfans have been able to put together. But there are one or two questions that even we as a team don’t necessarily know the answers to. Q: How do you keep track of all the story elements? During the production of SOMA there was an awful lot of timeline stuff going on. Here we have to thank our Mikael Hedberg, Mike, who was the main writer. He was the one to make sure that all of the pieces of content were held together and consistent across the game. A lot of the things got rewritten because major historical timelines changed too, but Mike kept it together. During the development we had this weird narrative element we call the double apocalypse. At one point in writing most of the Earth was dead already because of a nuclear war, and then an asteroid hit and destroyed what was left. We went back and forth on that and it became clear that a double apocalypse would be way over the top and coincidental. So we edited the script to what it is now, but this has resulted in the internal term ‘that sounds like a double apocalypse’, which is when our scripts have become just a bit too unbelievable or coincidental. Q: How do you convey backstories, lore, and world-building? Obviously there are clichés like audio logs and walls of text, but there is a trend to do something different with them, or explaining the universe in a different way. But the fundamental problem is relaying a bunch of information to the player, and the further the world is from your everyday 21st century setting, the more you have to explain and the harder it is. So it’s understandable that a lot of games do it in the obvious way. The best way I’ve seen exposition done is by working it into the environment and art, making it part of the world so that the player can discover it rather than shoving it into the player’s face. Q: How do you hook someone who disagrees with the character? It’s hard to get the character to say and feel the same things as what the player is feeling. If you do it wrong it breaks the connection between the player and the character, and makes it far less intense. Ideally, if the player is thinking something, you want the character to be able to echo it. We spend a lot of time taking lines out so the character doesn’t say something out of place or contrary to what the player feels. With philosophical questions there are fixed messages you can make and things you can say about the world, but that will put off a part of the audience. The big thing when setting moral questions or decisions is that you should ask the question instead of giving the answer. If you offer the players a grey area to explore, they might even change their minds about the issue at hand. To murder or not to murder, that is the question. Q: How do you write for people who are not scared of a particular monster or setting? In my experience the trick is to pack as many different types of fear in the game as you can, and picking the phobias that will affect the most people. If there’s only one type of horror, it’s not going to catch a wide enough audience. Also, if you only put in, say, snakes, anyone who isn’t afraid of snakes is going to find it dull. Q: What’s the main thing you want to get across in games? The key thing is that the players have something they will remember when they walk away from the game, or when they talk about it with other people. It’s different for different games, and as a developer you decide on the effect and how you want to deliver it. In games like Left 4 Dead delivery might be more about the mechanical design. In other games it’s a particular story moment or question. In SOMA the goal was not to just scare the players as they’re looking at the screen, it was about the horror that they would think about after they put the mouse or controller down and were laid in bed thinking about what they’d seen. It was about hitting deeper themes. Sure, we wrapped it in horror, but the real horror was, in a way, outside the game. Q: What does SOMA stand for? It has many interpretations, but I think the one Thomas and Mike were going for was the Greek word for body. The game is all about the physicality of the body and its interaction with what could be called the spirit, mind, or soul – the embodiment of you. The funniest coincidence was when we went to GDC to show the game off to journalists before the official announcement. We hadn’t realised there is a district in San Francisco called Soma, so we were sitting in a bar called Soma, in the Soma district, about to announce Soma! As to why it’s spelled in all caps – it happened to look better when David designed the logo! Q: Does this broken glass look like a monster face on purpose? I’m pretty sure it’s not on purpose – it’s just because humans are programmed to see faces all over the place, like socket plugs. It’s called pareidolia. But it’s something you can exploit - you can trick people into thinking they’ve seen a monster! This window is out to get you! Q: What is the best way to network with the industry people? Go to industry events, and the bar hangouts afterwards! It’s critical, though, not to treat it as “networking”. Let’s just call it talking to people, in a room full of people who like the same stuff as you. It’s not about throwing your business cards at each other, it’s about talking to them and finding common interests. Then maybe a year or two down the line, if you got on, they might remember you and your special skills or interests and contact you. Me being on Will’s stream started with us just chatting. And conversations I had in bars five years ago have turned into projects this year. You have to be good at what you do, but like in most industries, it’s really about the people you know. I’m a bit of an introvert myself, so I know it’s scary. But once you realise that everybody in the room is probably as scared as you, and that you’re all geeks who like the same stuff, it gets easier. Another good way to make connections is attending game jams. If you haven’t taken part in one, go find the nearest one! Go out, help your team, and if you’re any good at what you do, people will be working with you soon. Q: Can you give us some fun facts? - You can blame the “Massive Recoil” DVD in Simon’s room on our artist, David. A lot of the things in Simon’s apartment are actually real things David has. - We try to be authentic with our games, but out Finnish sound guy Tapio Liukkonen takes it really far. We have sequences of him diving into a frozen lake with a computer keyboard to get authentic underwater keyboard noises. It’s ridiculous. - Explaining SOMA to the voice actors was challenging – especially to this 65-year-old British thespian, clearly a theatre guy. Watching Mike explain the story to him made me think that the whole situation was silly and the guy wasn’t getting the story at all. And then he went into the studio and completely nailed the role. - There’s a lot of game development in Scandinavia, particularly in Sweden and Norway, because it’s dark and cold all the time so people just stay indoors and make games. Just kidding… or am I?